Journey Grants – a William Jewell College specific grant that offers students a chance to complete a unique learning opportunity funded by the institution – are widely celebrated throughout the College. However, recently the program has been the cause of much controversy on campus due to changes made in the past year. The Grants were made more competitive this year and significantly more applicants were denied as a result. Many reasons, primarily budget cuts, factored into the changes that made Journey Grants a more competitive process than in years past. The heightened competitiveness of the Grant application and acceptance process angered many students – especially as students’ prevailing understanding of Journey Grants was that they were essentially guaranteed as part of the Jewell experience. Nick Hartwig, senior chemistry major, and Colton Johnson, junior business administration, accounting and Applied Critical Thought and Inquiry (ACT-In) major, applied for Journey Grants in the most recent round of applications. Their trip proposal entailed visiting and studying WWII, more specifically Holocaust, sites across Europe. The pair requested the standard $2,000 amount and made their proposal in conjunction with an advisor and frequent visits with Sara Round, director of global studies and Journey Grants. Their proposal was rejected. That notion, that the Grant is guaranteed to every student, is one that confuses administration. The official literature on Journey Grants does not say that the Grants are guaranteed, nor does it specifically say they are competitive. The public webpage for Jewell Journey Grants says that students can apply – denoting that, because an application is required, they are competitive. “We’ve always had an application process. For me, having an application process signals something. If it were guaranteed why would we even have an application process? Why would we form a decision-making body that’s looked at those applications?” said Dr. Anne Dema, provost of the College. The 2018-2019 Jewell Journey Grant Program Guide, found on an open Moodle page students interested in the Grants can join, states that students are eligible to apply for a grant and list the requirements for applications. The Wikipedia page about the College, however, states that “William Jewell’s unique Journey Grants program offers a minimum $2,000 award to every junior to complete a self-designed, life-enriching experience anywhere in the world.” The page was last edited Oct. 22, 2018. The vague narrative in the literature may be due to the variation in phrasing on official Jewell sites. As well, Journey Grants are guaranteed to students in the Oxbridge Honors Program. The fact that they are guaranteed to one group of students may cause others to believe they are guaranteed for all. “We’ve always directed students to where the rules and guidelines are, but they’ve never been guaranteed, and they’ve never been part of that language that says they’re a part of tuition or a scholarship in that same sense. I would say that the only difference in terms of where we make that sort of statement, would be for Oxbridge students. Oxbridge students are notified when they’re accepted into the program that when they go abroad, their Journey Grant will be in support of their study at Oxford,” said Dema. Another belief many students hold is that a Journey Grant is included in the student tuition and thus guaranteed. This rumor, though, has no validity – one has only to check their tuition statement to see that a Journey Grant is not included. Students may have also believed that Journey Grants were guaranteed because, in the past, little to no applications were denied. This perception is probably the result of conditional approval – a policy the Journey Grant program has since eliminated with the recent changes. The loss of conditional approval certainly heightened the competitive nature of the Journey Grants. While upsetting for those denied, increased competition will likely improve the quality of submitted Journey Grant applications moving forward. “I think the program and the experiences will be of higher quality across the board because of this additional structure. Though that also means that not all proposals are funded, and that’s disappointing. I think that one of the challenges in the past has been [that] the committee was very open to working with students who submitted less than ideal proposals in the past,” Dema said. Without the conditional approval, those that may have had their proposals conditionally accepted for a Grant this round were instead denied – perhaps increasing the visibility of denials and the increase in competitiveness as compared to years past. The disparity between the perceptions students have about the Journey Grants and the true details of the program is likely due to a lack of thorough communication between faculty and students. When the changes to the Journey Grants were made last year, an email was sent from Round at the beginning of fall 2017 to all students eligible for 2018-2019 Journey Grants. A portion of the pdf document prepared about the 2018-2019 Journey Grants. According to the document Round prepared for the faculty and Student Senate, at least six additional emails describing application deadlines and resources students could use for their applications were sent out after the initial email. The same pdf document explaining changes to the process was included as an attachment on all follow-up emails. However, beyond those emails, no further communication was given to students regarding the increased competitiveness of the Journey Grant process. Whereas the College has hosted town halls and sent letters to facilitate effective communication in the past, neither method was used to discuss changes to this program. “I think what really happened is that the new process for applying wasn’t communicated effectively enough so students could be fully aware of the new expectations for the Journey Grant. I would say we just had a communication gap there,” said Jakob Miller, senior math and economics major and president of Student Senate. Although students were told that not all Journey Grant proposals would be accepted, no specific number was given to students as to how many proposals would be approved. In the most recent round of applications, the institution expected – based on application numbers in previous years – a total of 47 proposals to be submitted. Instead, 59 first time Journey Grant applications were submitted. The College accepted 25 of those proposals. “I want them to let us know how many Journey Grants they are going to allow to give at one time because usually, it’s almost like a given thing – at least in the past it has been. Especially, a lot of people have been applying for things that probably shouldn’t be given out, but they still get it. So I think it probably would’ve been nice to know, ‘listen, it’s going to be a lot more strict, a lot of people applied and we aren’t going to be able to give out as many Journey Grants this year,’” said Sam Sullivan, senior digital media communications and ACT-In major who is interested in film production. Sullivan’s Journey Grant proposal, a one-week film workshop at the New York Film Academy in Miami, was approved for the standard $2,000 amount. Though much of the written information regarding Journey Grant criteria can be found on the Journey Grant section of the Jewell website and the open Moodle page, the way that many students form their perception regarding Journey Grants is through information carried by word-of-mouth communication between other students, Cardinal Blazers and admissions counselors. The false perceptions that current Jewell students may have about Journey Grants are at risk of being passed down to prospective students when the former participate in tours or panels aimed at recruiting the latter. Hartwig and Johnson, both players on Jewell’s football team, recalled learning about Journey Grants during their recruitment. They remember Journey Grants being portrayed as a guaranteed aspect of their academic experience. Now, as members of the team, they recruit prospective student-athletes with the same information they received in the past. Maria Schollmeyer, senior nursing and ACT-In major, was asked in the past by a former admissions counselor to share her potential Journey Grant plans to prospective students at her high school as well as at recruiting events for Jewell’s nursing program. “They would ask me to say what my planned Journey Grant was to all of those people and they made it sound like it was an additional major that you could get,” said Schollmeyer. Schollmeyer planned on going to Washington D.C. and surrounding areas to visit Johns Hopkins Hospital and Sibley Memorial Hospital to shadow nurses and nurse practitioners in their specialties and observe how the scope of practice can differ in an urban setting from the ones Schollmeyer is accustomed to in suburban Missouri. Schollmeyer emphasized her interest in Johns Hopkins’ specialization in innovation research. She specified the great opportunity to observe and learn from professionals at a such a renowned clinic. “In the medical field, there are multiple places that people talk about where they do a lot of great, innovative research and it’s important especially in our practice because obviously, that research and the things that they find, implement my career in my patients and how I care for people. There are multiple places where they do innovative research, a couple of them that everyone knows, like the Mayo Clinic and Johns Hopkins,” said Schollmeyer. Despite being specifically prompted by College officials to discuss these plans with prospective students, Schollmeyer did not receive approval for her Journey Grant. Along with student panels made up of current students to recruit prospective students, student Cardinal Blazers are a crucial part of how information to prospective students regarding Journey Grants is spread. Schollmeyer, a past Cardinal Blazer, recalled that the training to be a Cardinal Blazer prepared her to portray information about Journey Grants in a certain way. Schollmeyer recounted what she said about the Grants to prospective students in the past. “You say ‘As long as you are in good standing with the college, every student is granted a minimum of $2,000’ and the only time when they acted like it wasn’t guaranteed was when you needed to apply for the additional $4,000 grant,” said Schollmeyer. Before these recent changes, the aforesaid notion regarding how Grants were administered was, in most cases, true, so students felt no need to state otherwise – reinforcing the belief of the supposedly guaranteed nature of the Grants. However, the portrayal of the Journey Grants by students does not necessarily mirror the language and expectations about the program set by the admissions staff at Jewell. Brian Haines, director of admissions, noted that the print material from the admissions staff was never intended to portray the notion that Journey Grants were guaranteed. “I don’t think that was necessarily the language that we used for students, I think it was all about the opportunity and that it exists for all,” said Haines. Although the language regarding Journey Grants was focused on showing that the Grant was an opportunity every student could apply for but was not necessarily ensured, the strong impression among the student body that Journey Grants are guaranteed speaks otherwise. Because of this, the admissions staff has taken note and is dedicated to changing the language that may have been misperceived in the past. The admissions staff needs the feedback of students to help determine where the issue stems from so they can have the opportunity to change it. How Jewell is portrayed to prospective students and the public is also in the hands of current students who embody the Jewell community, not just the admissions staff. “I think if you are on campus and you pass by a tour, whether it’s a counselor or Blazer, and you hear something that isn’t quite right, just shoot me an email to let me know because then we can adjust it. We don’t have someone following along every single tour and interaction, so we can adjust and correct how we talk about things. It’s good to have open feedback and dialogue,” said Haines. Administration, alongside admissions, strives to correct the communication issue that likely caused the misperception regarding Journey Grants. “I get the confusion, and we absolutely have to make that more clear, it’s likely because of the change in the past year that has brought to light more of what an issue that can be in terms of sharing that narrative when we weren’t obviously denying, conditionally approving people didn’t provoke this,” said Dema. A false perception about Journey Grants that has stemmed from the miscommunication over the recent changes is that, because of the increased competitivity, students will get approved for a Grant only if are going on a faculty-led trip. Although the official literature on Journey Grants did state that priority would be given to faculty-led trips, not all were accepted. Only nine of the 25 accepted Grant proposals were for faculty-led trips. Even though less than half of the approved proposals were given to those participating in faculty-led trips, the fact remains that it is a common perception that they are automatically accepted. This is a perception that worries those in administration who are working to change that notion and adjust the program accordingly. “We have to figure it out because some of the best Journey Grants, and the ones we have always been the most excited about, are those that students develop, that fit their passion. I’m unsettled by the notion, and again I’ve just heard anecdotal stories of students saying ‘oh well, if I want an experience I better just take the faculty-led experience, because I have a better chance of funding for that.’ That’s a misperception. Now there are good faculty-led trips, so we have to figure out how do we do this, and [how] the committee makes its decisions and communicates,” said Dema. These circumstances are indicative of a need for increased transparency around College run programs. 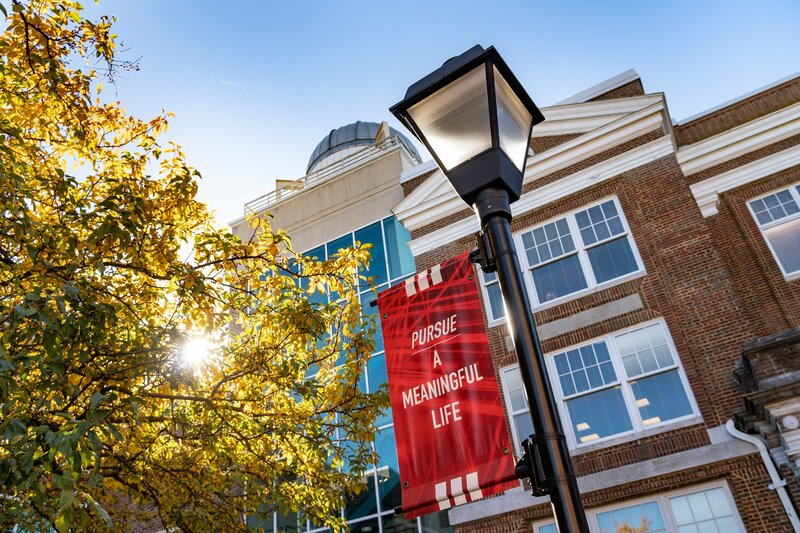 Both students and staff recognize this need and those in charge of Journey Grants – Round, a faculty committee and Jewell administration – are taking the concerns of students into account moving forward. Changes will likely be made to adjust to the concerns those in charge are hearing from students – primarily about faculty-led trips and the lack of clarity in the literature and discussion of the Grants. 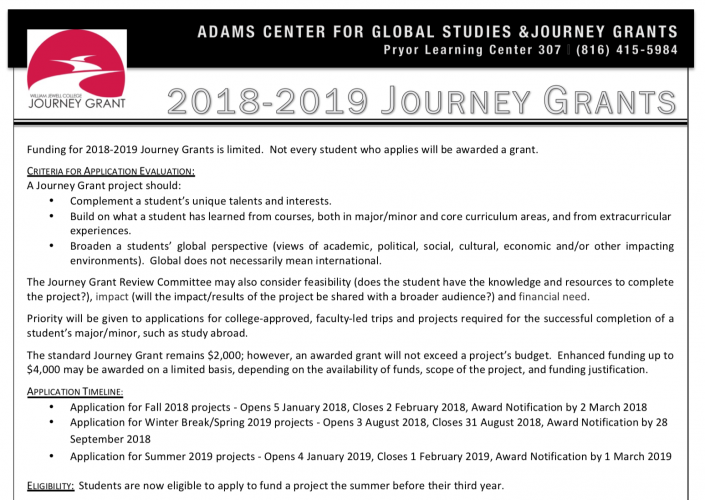 Students looking to apply for Journey Grants for the summer of 2019 should keep in mind the recent changes made to the program and the increased competition due to those changes. According to the document prepared by Round for Student Senate and faculty, an average of 95 students apply for summer Grants – based on numbers from previous years. This year, the Journey Grant committee is able to award between 35-40 Grants.